A three-quarter length portrait of an adolescent girl standing in the awning of Evans-Pritchard's tent, with other children seated at her feet. Based upon film numbers this image was probably taken among the Gaajok at Mancom where Evans-Pritchard spent some four weeks at the home of his servant Tiop, who he first met in 1931. Note on print reverse ms pencil - "40 4" & print front border ms ink - "NUER XII/12"
Morton, Chris. 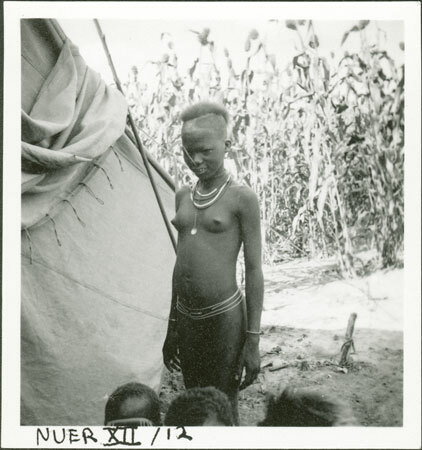 "Nuer girl" Southern Sudan Project (in development). 03 Jan. 2006. Pitt Rivers Museum. <http://southernsudan.prm.ox.ac.uk/details/1998.355.552.2/>.